A small, thin, long-necked bottle of transparent slightly greenish yellow glass was found near Ein Gedi in Israel’s Judean Desert in 1961 (Fig. 4). I was allowed to handle and study the piece in 2008, and I can confirm that it was certainly made by glassblowing. The bottle has a surprisingly early date: mid-first century B.C., according to a 1983 publication by Nahman Avigad.3 More recently, the date has been moved forward somewhat. The Ein Gedi Bottle Video shows the rim being finished while the vessel is held with a simple clamplike device (sometimes called a “snap” or “gadget”). During this procedure, the bottle can still be hot, having just been broken free of the blowpipe, or it can be at room temperature well after annealing. The pontil is arguably a slightly later invention, because the earliest blown vessels are without pontil marks. The Ein Gedi bottle. Mid-first century B.C. H. about 12.7 cm. The Israel Museum, Jerusalem. Photo: © The Israel Museum, Jerusalem/by Peter Lany. The Bowl with Roman Foot and External Folded Rim Video shows the making of particular vessel elements: a so-called Roman foot and an outfolded rim. A pontil is used in place of a clamp or snap for holding the vessel after it is separated from the blowpipe. Fresco, still life with peach branch. Roman Empire, Pompeii, first century A.D. Museo Archeologico Nazionale, Naples. Photo: De Agostini Picture Library / G. Nimatallah / Bridgeman Images. Color-band bottles, which are also known as color-band mosaic bottles and ribbon bottles, are usually dated to the first or early first century A.D., and they are described as “Western” or “probably Italy” (Fig. 6). They combine fusing and glassblowing, thus combining a long-established technology and what was then a newly emerging one. The Color-Band Bottle Video shows the annealed bottle, held with a clamp or snap, during the folding and shaping of the rim. However, this could have been carried out while the vessel was still hot, just after it was broken free of the blowpipe. The inflation of a molten bubble inside a mold seems to have been an early first-century A.D. development (Fig. 7).5 While mold blowing was also practiced in the eastern Mediterranean, the example used in the Gladiator Cup with Handles Video is certainly Western: the cup is decorated with images and names of Roman gladiators who were active or retired when the cup was made. Full-size mold blowing was used somewhat sparingly by Renaissance Venetian glassblowers. In the video, a bronze mold (made by David Hill) is employed; in antiquity, the molds were probably made of terra-cotta (Fig. 8). The rim is shown being formed by the early first-century invention of “cracking off.” This technique may have been unknown in Venice between about 1500 and 1700. Terra-cotta mold for an Ennion cup in The Corning Museum of Glass (66.1.36). The mold is thinly lined with soot. Reproduction made by David Hill, 2015. Photo: Mark Taylor, courtesy of David Hill. 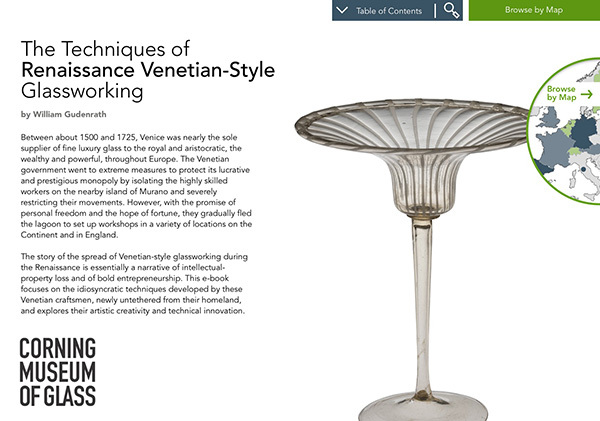 The rather extreme virtuosity we see in Venetian glass of the late 17th and early 18th centuries is not entirely unprecedented. Some third- and fourth-century Roman glass was made by workers who were nearly as skilled as their later counterparts. Although there is certainly no direct connection between them, the degrees of difficulty displayed in their work, as well as their excellent craftsmanship, are comparable. The two objects illustrated in Figures 9 and 10 were probably made in Cologne, Germany, by Roman glassworkers during the mid-third century. Flask with doves. Cologne, mid-third century. H. 24.5 cm. Römisch-Germanisches Museum der Stadt Köln (inv. no. 674). Photo: Rheinisches Bildarchiv Köln (RBA_mf140875). The “Masterpiece.” Cologne, second half of the third century. H. 27.5 cm, W. 16.0 cm. Römisch-Germanisches Museum der Stadt Köln (inv. no. 541). Photo: Rheinisches Bildarchiv Köln (RBA_d030714_1).